I've finished another ensemble on my winter sewing list! 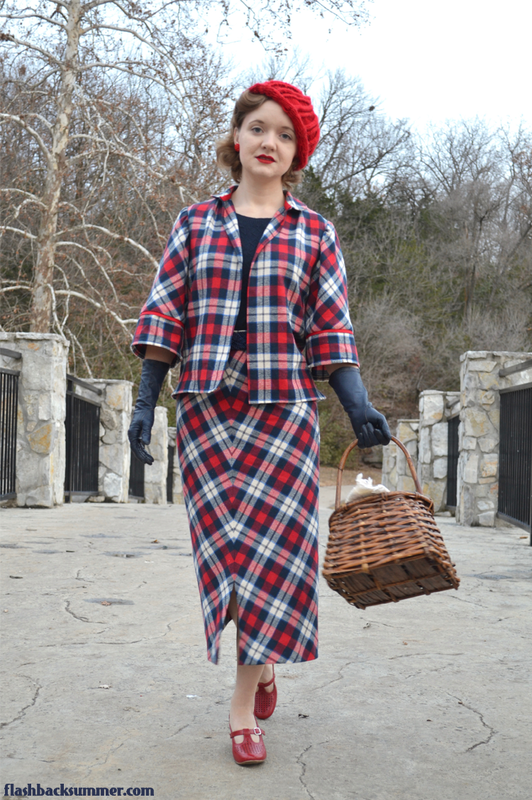 I based this suit on illustrations from mid-1930s magazines I have. They commonly have sets of a dress or skirt with a boxy, hip-length swing jacket. I rather like the versatility pieces like this bring to my wardrobe. I have a lot of navy and red, so now I have a couple more pieces I can mix and match with them. Hurray for versatility! When I started planning this outfit, I knew I needed to be especially careful of proportion and fabric usage. I had three yards of the fabric to use, which is not much for a whole suit! (It's from the "Plaiditudes" line at Joann.) I also wanted to be wary of proportion. 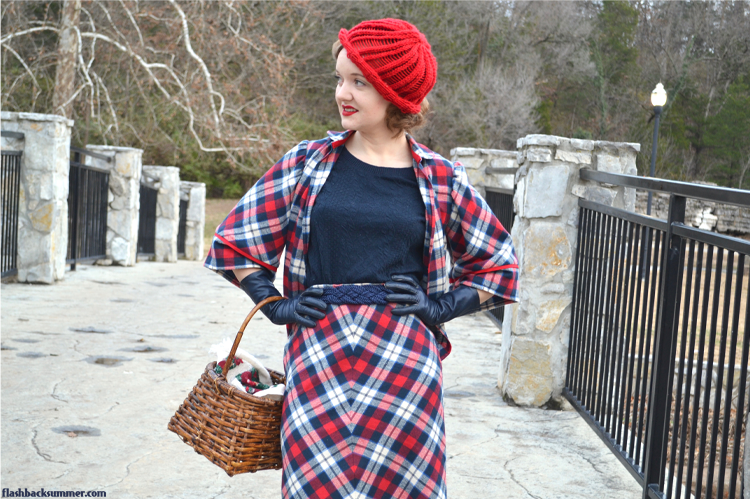 Boxy, hip-length jackets can be quite unflattering for a petite pear such as myself, so I wanted to be sure to get the skirt shape, hem length, and jacket all in sync to create the 1930s elongated silhouette. I used a 1930s basic skirt pattern I have made up before, but this time I added a waistband and cut it on the bias. I wanted to be sure the skirt was slim in order to counteract the boxy jacket. Cutting it on the bias also allows the plaid to be at a flattering diagonal angle. As for the hem length, this is extremely important to get right for 1930s fashions to be flattering. While it seemed counter-intuitive to me at first to wear a longer length skirt as a short person, it does actually work! Putting the skirt at the mid calf or even slightly lower creates a "legs for days" look that was so popular in the 30s. The jacket was another matter! 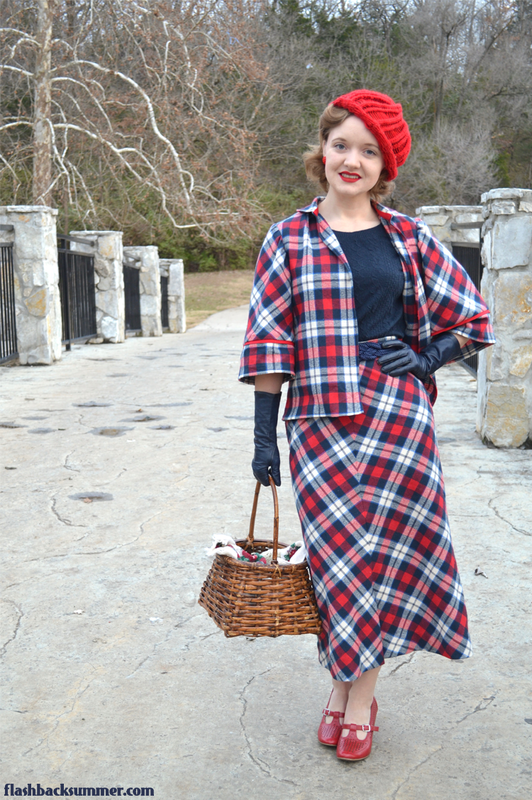 I didn't use an official pattern; instead I based it on a tracing I made of an authentic 1930s dress and jacket set I used in my make-do-and-mend gray suit series. I lengthened the sleeves and didn't gather them into a cuff like the original. Of course, cutting the skirt on the bias was important for design and fit reasons, but it takes up a lot of fabric, particularly to line up the pattern at the center seams. This didn't leave as much fabric as I would have liked for the jacket. I did, however, have enough for the front and back bodice pieces, so it was only the sleeves that I had to work out. I ended up putting the top part of the sleeves on the bias to fit them on some random scraps. However, the above-the-elbow length wasn't flattering, so I added another strip of plaid below those. That created another problem of a random seam, so I decided to highlight it with flat piping and try to turn it into a design element. 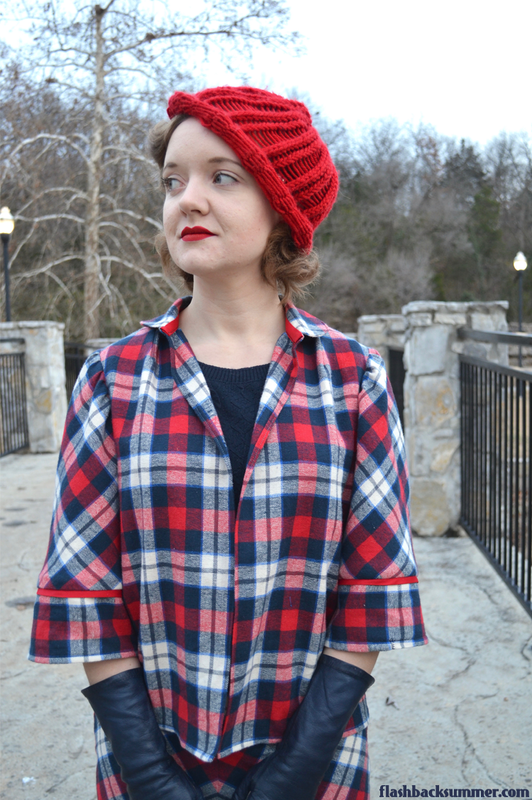 I topped off the jacket with a peter pan collar that can be buttoned at the top or left open as I did here. I used to have quite a few hats, but over time I've gotten rid of most of them. I still have a few, but I'm finding they don't quite work for my outfits and shorter hairstyle still, so I'll probably cull them further. I do keep reaching for this red beret a friend made, so I think I need another red hat! I also recently found these navy leather gloves in a flea market. I wish they were a tad bit longer to fit with these jacket sleeves better, but they still work! At the opposite end, I wore these new-to-me red shoes. They're fantastically comfortable Chelsea Crew heels, and you'll be seeing them often! 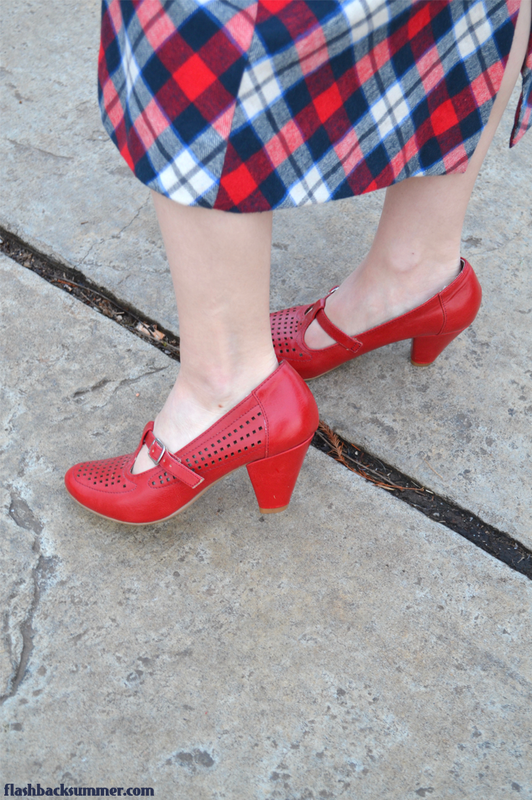 They're now my only closed-toed red shoes, and since I wear a lot of red... I think you'll be seeing these a lot the rest of this winter. What do you guys think of mid-30s suits with boxy jackets? What about longer hem lengths? They're both a bit difficult to get right. Have you successfully found pieces for yourself or for others that are flattering? Thank you so much, Jenny! :) My friend made the hat and I've worn it SO much! P.S. I have that same belt, incidentally! I'm petite with an hourglass/pear shape silhouette. I also thought, that the 1930s dress length would be unflattering for me, but on the contrary. It looks a lot better than in 1920s dresses anyhow. :) I think it's all a matter of the length of the skirt - sometimes an inch can turn a good looking skirt/dress to one that makes you look short and fat. I love the outfit and I love your belt! You're SO right, an inch can make all the difference in these sorts of things! 20s and 30s can be really tricky, but I'm convinced that finding the right proportions is the key to making them work for any shape or size! Thank you! I love every thing about this outfit! The different directions in the jacket look totally intentional! If you like the look of them, 20s and 30s styles could work fabulously on you! They're often more easily flattering on tall women and both preferred a narrower hip. They also have lots of flowy, feminine fabrics that can help soften things. This suit is soooo amazingly gorgeous! I totally love it! The sleeves are genius, they actually create a really lovely detail and the multi-directional checks is so classically 1930s. It took me a while to come to terms with wearing longer length skirts,as I'm only 5ft 3, but now I can't go back. All of my 1930s skirts are from about 3 inches below the knee to lower calf and I love them all! Yay for short girls with long skirts!!! It is a leap initially, but I like them better now too! I love it! 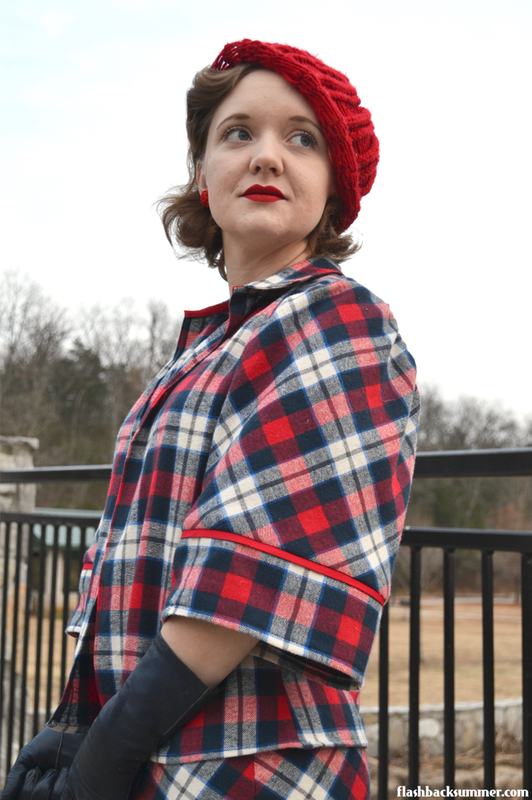 Not least because I'm also working on a red plaid bias cut skirt right now. I haven't done anything '30s yet, but am thinking about it, so this is a great piece to see for inspiration. Thank you! Ha, great minds think alike! 😉 I'd love to see yours when you're done. I loooooove this ensemble!! Your plaid matching on the skirt front is superb. I do like the longer gen lengths frequently. I never hem anything shorter than about 27", which hits me almost at mid-calf. 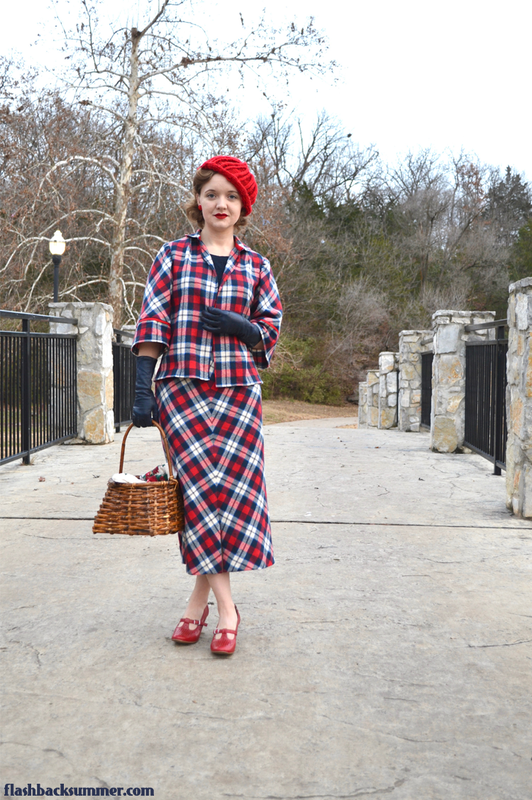 I'd love to make a couple of slightly longer, '30s length skirts. Thank you! And yes, on my first 30s makes I left the skirt pieces long so I could experiment on the hem length. I tried different lengths till I found a flattering one I liked! Great job not only fitting all of the pieces on a small amount of material- but at matching the plaid so beautifully too! I feel like so many of my projects I face the same problems- using every scrap to squeeze all the pattern pieces on. A lot of the fabric I own is cut at 2 metres, since I bought it without really knowing what I was going to use it for, and then I find that 2 metres isn't enough. :( But, then it becomes a make do and mend project, and there isn't any wastage! 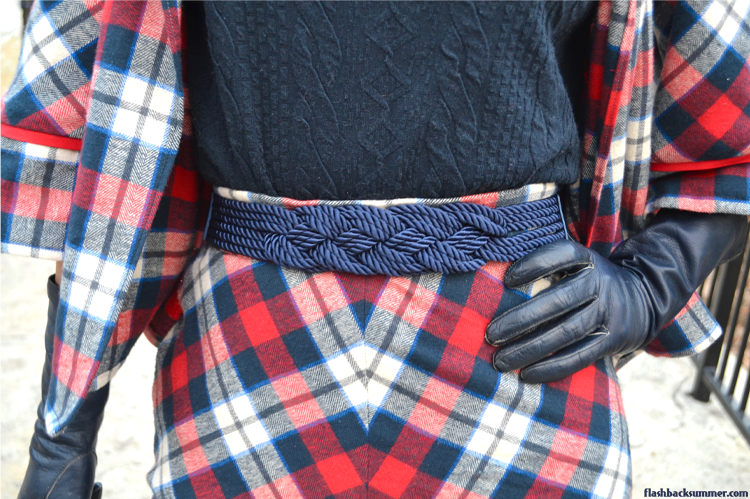 This is a very lovely and classic outfit- and that braided belt is so pretty too! This is a wonderful outfit! I love the style of the skirt and jacket and everything is better in plaid! Great hat too. I am constantly inspired by your sewing skills, especially with your chevron-ing skills here. Also, what a gorgeous color palette! I love this suit and how it came out. I especially love the jacket. It looks so warm and cozy.